Ten Speed Press, 9781580089647, 208pp. Louisa's latest book, The New Persian Kitchen, is a fresh take on the vibrant cuisine of Iran. Her first cookbook, Lucid Food: Cooking for an Eco-Conscious Life, is a collection of seasonal recipes that was nominated for an IACP award. Louisa has cooked at restaurants in San Francisco and New York, including Millennium, Aquavit, and Pure Food and Wine. She has created original recipes for Whole Living, Food Network Magazine, Prevention, and Better Homes and Gardens. Look for her on the Cooking Channel's Taste in Translation series, making Persian kebabs. Learn more about Louisa and watch her cooking videos at lucidfood.com. "Lucid Food isn’t just a mere cookbook but a blueprint for accessible, eco-friendly living." "With earthy tones and recipes organized by season, Lucid Food by Louisa Shafia becomes a year-round guide to cooking in rhythm with the earth. Shafia combines tips with unusual recipes that take the stress out of incorporating conscious practices into your daily life." 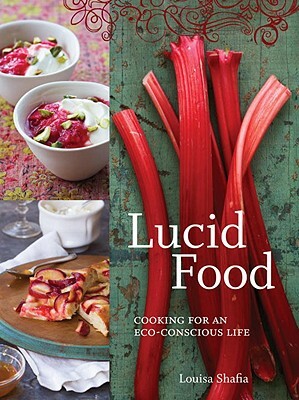 "Whether you are inclined to forage for your food or find it at your local farmers market, Lucid Food: Cooking for an Eco-Conscious Life is a must-read addition to your kitchen bookshelf." “There's no shortage of books that proselytize in favor of local and sustainable eating, but few manage to espouse their arguments in such a tasty manner as Lucid Food: Cooking for an Eco-Conscious Life”.